Skin products that are specially formulated to be applied after being out in the sun do not reverse damage. They are created to prevent moisture loss while encouraging new skin cell development. In order to reap the most benefit, the product should be applied immediately after sun exposure and reapplied two or three times throughout the day. If kept in the refrigerator, the lotion also offers soothing, cooling relief. After bathing is the ideal time for at-home caregivers in Oshkosh to apply the formula to lock in moisture. The quick absorbing and intense hydrating formula is one of the company’s best-selling products. Perfect for use on the face and entire body, the lotion’s many ingredients include aloe vera, bee pollen, coconut oil and linden flower extract, which also nourish and moisturize skin. Oshkosh respite caregivers should apply this product after their senior loved ones spend some time outdoors. Made with coconut oil and papaya extract, the Hawaiian Tropic formula is just thick enough to hold in moisture and protect delicate skin. Ideal for a day or night out, the unique formula also features ingredients that give skin a slight shimmer that catches the sun or interior lights, which gives skin a healthy, youthful glow. The gel formulated by the Lauren Hartmann Company cools and soothes upon application to eliminate heat and sun damage discomfort. The unique yogurt preparation is designed to nourish skin. Instead of containing a long list of harsh products, the cooling gel is enriched with organic plant extracts. With a fragrance reminiscent of freshly brewed coffee, the formula contains coffee and green tea extracts that neutralize free radicals triggered by sun exposure. The caffeine and acids soften skin while encouraging blood circulation to damaged areas. The product additionally contains botanicals that act as emollients, which also hydrate, nourish and soothe dry, itchy and irritated skin. 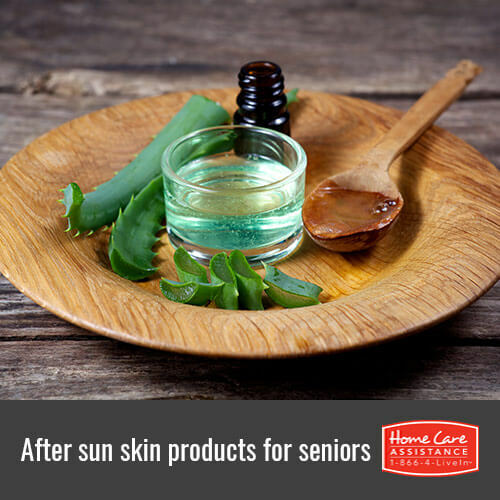 Be sure to help your senior loved one maintain healthy skin by applying after sun skin care products. You can learn more about senior skin care when you turn to Home Care Assistance in Oshkosh, WI. Our expertly trained caregivers enable seniors to age in place while helping them exercise, prepare meals, get around, and carry out daily activities around the house. Call 920-710-CARE (2273) today to learn more and schedule a no-obligation consultation.